So you’re rampantly Googling Sydney!!!! I have to write about the massive Australian city, as 13 MILLION people Google it per month! Well, I don’t blame those people, Sydney is indeed a very beautiful city. 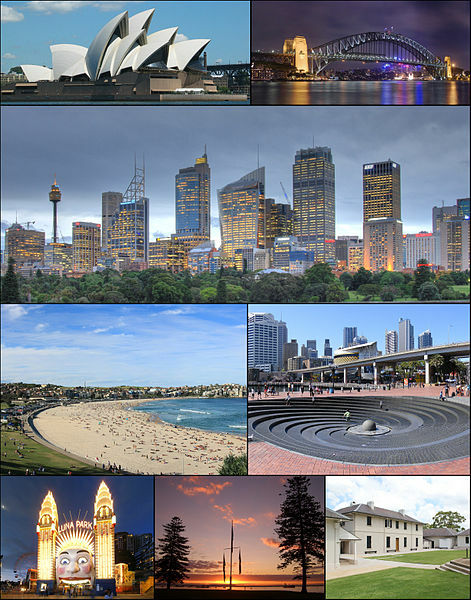 Sydney is the capital of New South Wales, and with a population of over 4.5 million it is Australia’s largest city. Now, I can hear you thinking smugly (you cheeky thing! ), that’s small compared to New York, Tokyo, etc. Yes, but trust me is has the architecture, and infrastructure similar to the famous giant cities, internationally. Sydney is an extremely beautiful city with a lot of sights to BLOW you away! The Sydney harbour is Sydney’s most attractive spot, with a beautiful view of the city skyline. Some major destinations that you’d be SILLY not to see are: the Harbour area, the Harbour Bridge (you can climb it if you pay), the Opera House (World Class), Bondi Beach, Olympic Park (remember the 2000 Olympics?!). Taronga Zoo is an excellent place to go, who know maybe you can be an animal there? JUST joking, lol, the zoo is awesome with almost 3000 rare species of animals, like tigers, bears, asian elephants, etc. Oxford St has an incredible shopping district for you to irrationally spend your money!! And if you’re not depleted of life savings yet you can also go to the designer shops in Darlingburst. You can chill out at some of the relaxing parks like the botanical gardens or hyde park which are full of every possible type of fancy vegetation. Sydney’s China town makes for an excellent visit, with loads of Asian restaurants and shops. Sydney is an especially great place to celebrate the new year as they have the biggest celebration in Australia, at Sydney, with a spectacular display of fireworks.